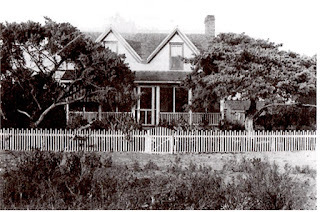 By the end of the Civil War in 1865 all of Ocracoke’s former slaves had fled the island. Interestingly, two former slaves, Winnie Blount (“Aunt Winnie”) and her husband Harkus (Hercules) Blount, moved to Ocracoke from Bount’s Creek, NC, with a Williams family in 1866/1867. Harkus was a boat builder and carpenter; Aunt Winnie (ca. 1825 – 1925), worked as a domestic. The Blounts were the only post-Civil War black family to call Ocracoke home for more than one hundred years. Aunt Winnie's granddaughter, Muzel Bryant (1904-2008), was the last of the family to live on Ocracoke. Muzel died just shy of her 104th birthday. Click here for more information about slavery on Ocracoke Island. ...but please don't feed them! As you drive around Silver Lake harbor you may notice a number of Canada geese and mallard ducks. 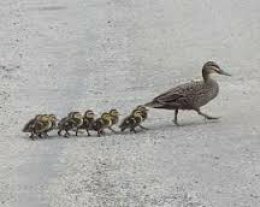 The ducks look cute, especially the little ones following after their mothers, but geese and mallards are migratory waterfowl that are protected species. Feeding them interferes with their migratory habits, and contributes to an unsanitary situation in Ocracoke village. A large resident population of these birds is creating a nuisance for residents and visitors. 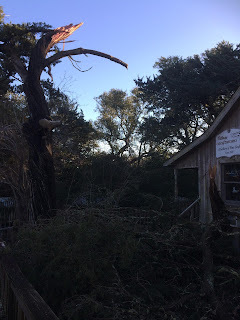 So, please do not feed the ducks in Ocracoke village. We will all be happier. You can read more about ducks in the Ocracoke Current and in the Ocracoke Observer. Several years ago I had an opportunity to join Capt. Ed Farley and his crew on the working skipjack H. M. Krentz, as they dredged for oysters in the Chesapeake Bay. Here are just two of the photos I took. In this first picture, two of the crew are culling oysters that have just been dredged up. This next photo shows piles of oysters on both sides of the deck. The H. M. Krentz is a vessel similar to the Wilma Lee that is berthed at the Community Store dock. 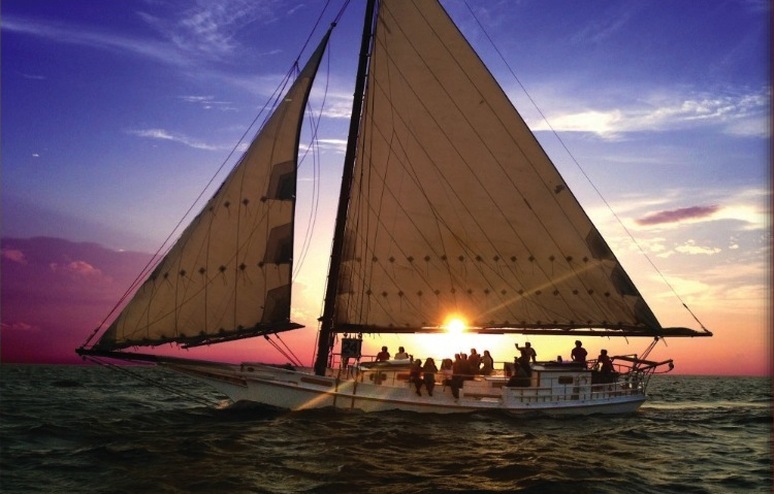 In the summer months, the Wilma Lee is available for sunset cruises in Pamlico Sound. Like the Wilma Lee, nowadays from April to October Capt. Ed and the H. M. Krentz are available for relaxing sailing charters departing from the Chesapeake Bay Maritime Museum in St. Michaels, Maryland. You can read more about the H. M. Krentz here: http://oystercatcher.com/. Nowadays one can bike, walk, or drive from one side of Ocracoke's Silver Lake harbor to the other in just a few minutes. It wasn't always so. In the sisters' day, two narrow streams (or "guts" as islanders called them) flowed from the harbor toward the bald beach. These streams (the big gut, and the little gut) effectively divided Ocracoke village into two main sections (Down Point, the area that included the lighthouse; and Around Creek, the area that included the Community Store). Eventually simple foot bridges were built across the guts in several places. However, the journey by foot (through soft sand and across the rickety bridges) from one side of Cockle Creek/Silver Lake harbor to the other side was not taken lightly. Miss Sue and Miss Lysee had a clear view of each other's houses across the harbor, but when Miss Sue took a notion to visit Lyzee she intended it to be a proper visit, and that meant packing her valise for the journey. After walking for more than an hour she wasn't about to turn right around and return home. She always stayed several days with her sister before walking back to the "Creek" side. Thanks to Miss Sue's great-grandson, Al Scarborough, for this story [correction: Al called to tell me he is Miss Sue's grandson, not great-grandson]. Outer Banks native, Johnny Moore, was a teenager in 1903. He was one of only five people who witnessed the Wright Brothers’ first flight on Dec. 17 of that year. According to legend, Moore raced down the beach shouting, “They done it, they done it, damned if they ain’t flew!” By 1948 he was the only surviving witness to that historic event. Moore, a commercial fisherman, continued to live on Little Colington Island, just west of Kill Devil Hills, until his death in 1952. According to his granddaughter, Karen Brickhouse (see link below), “Grandaddy would go out there and talk to [the Wright Brothers]. He would give them fish and the Wright Brothers would give him eggs in return. He always liked them and got to know them real well." Today, life-size bronze sculptures of Johnny Moore and the other witnesses are displayed at the Wright Brothers National Memorial in Kill Devil Hills. We have just published our latest Ocracoke Newsletter, the story of Beatrice Wells, child evangelist, who preached at Ocracoke in the late 1930s/early 1940s. You can read the story of Beatrice Wells here: http://www.villagecraftsmen.com/news022116.htm. Thurston Gaskill (1902-2000) was a much loved Ocracoke native and hunting & fishing guide. In an interview in David Shears' 1989 book, Ocracoke Its History and People, Thurston talks about working on the water for six decades. He also explains how islanders procured much of the lumber for their houses. "All the framing on this house," he says, referring to his home, now the Thurston House Inn, "came from the sailing vessel George Truitt, wrecked in 1928 in Ocracoke Inlet. It was picked up by me. 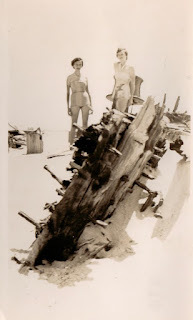 When the ship came ashore there was thousands of pieces of timber of various sizes washed up on the beach. Well, everybody in them days, you went down there to salvage what you could. You'd pile up your pile of lumber there and put your initials on it. Then later a sale would be held. Each pile of lumber would be auctioned. The man that actually collected it had a big advantage because he got -- I think -- a fifty per cent rebate. So I got enough lumber to build maybe two or three houses." 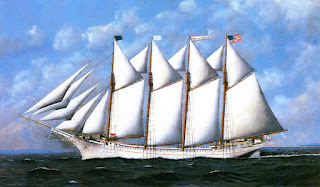 The George W. Truitt, Jr. was a 700-ton, four-masted schooner carrying 645,000 feet of lumber from South Carolina to New York City when she went ashore February 20, 1928, in a 40-mile-an-hour gale. According to the official shipwreck report, the ship's captain and crew "were saved by the heroic efforts of the coast guardsmen from the Ocracoke, Hatteras Inlet and Creed' Hill stations of the U.S. Coast Guard." 1910 Oil Painting of the George W. Truitt, Jr.
My grandson, Eakin Howard, took these photos of the Ocracoke lighthouse a couple of years ago. Enjoy! How many of our readers remember the days before indoor plumbing? 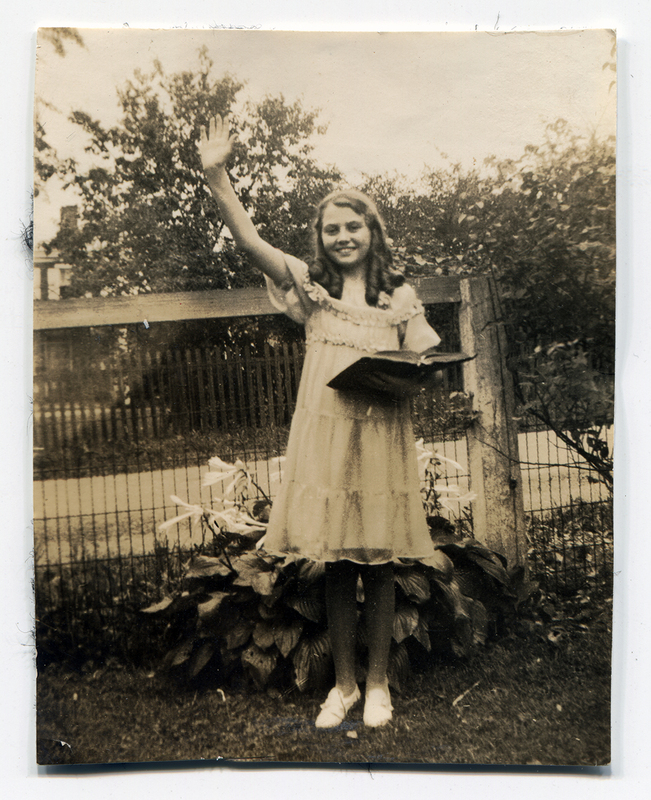 When I was a child my grandparents' house (where I now live) did not have a bathroom. 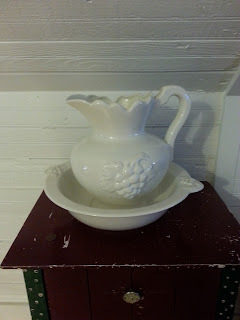 There was a pitcher & bowl set in every bedroom. There were also chamber pots in the bedrooms, and a privy outdoors. I have terrific memories of spending summers on Ocracoke more than a half century ago, but I wonder how many of us really want to return to "the good old days." Late last month, as I was walking along the beach, I found several beautiful seashells along the high tide line. There was a small moon snail (on the right in the photo below), a colorful scallop (bottom), and a slightly faded but unbroken scotch bonnet (top, left). The scotch bonnet is the official state seashell of North Carolina, and always a fun shell to find. 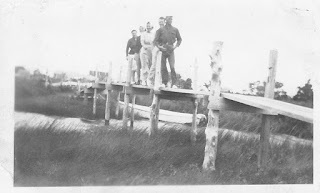 I recently published several posts asking if readers could identify various Ocracoke people, places, and events from years past. Following are the answers to those queries, with links to more information. Next is a mid-twentieth century photo (from the Paul & Mary Ruth Dixon collection) of the remains of the five-masted schooner Carrol A. Deering, that wrecked in 1921. The capstan (partially obscured by the young lady on the right) is the distinctive feature that identifies the wreckage. And finally, this photo was taken at the 4th of July pony penning sometime in the mid-1950s. This event took place where Ride the Wind Surf Shop and the Ocracoke Island Trading Company are located today. Capt. Marvin Howard, scoutmaster of the nation's only mounted boy scout troop, is astride the pony. His house is in the background, on the left. In the middle is the Homer & Aliph Howard house (where I live today), and on the right is the Herman & Flossie Spencer house (since moved, and now the Ocracoke Pizza Company). Dolphins are always a delight to see. 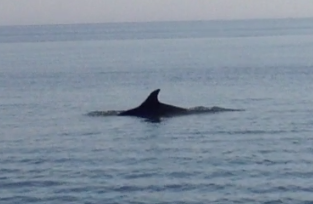 I have often seen them while sailing in Pamlico Sound (sometimes so close I could have leaned over the side of the boat and touched them), or while riding the ferries. Dolphins are most often sighted in the winter months, just beyond the breakers. At one time, dolphins and whales were hunted in coastal North Carolina. In case you missed it, we published an article about whale and porpoise fishing on the Outer Banks in August, 2015. Click on this link to go to it: http://www.villagecraftsmen.com/news082115.htm. 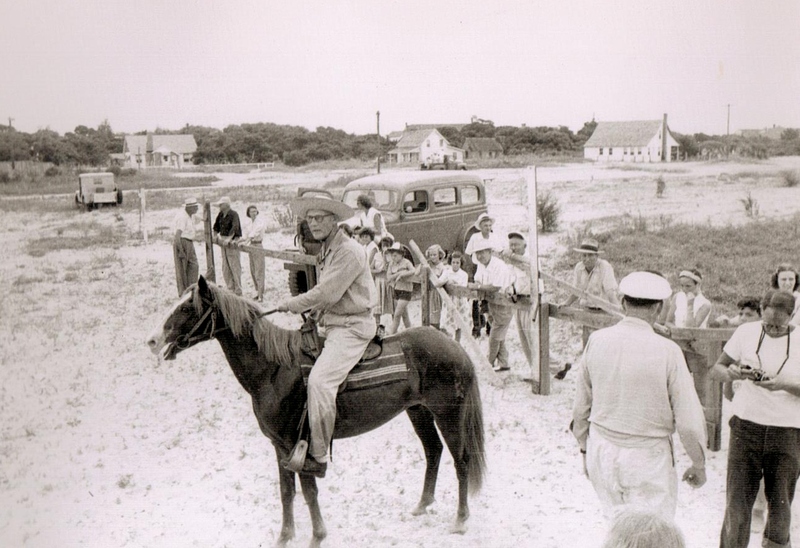 Here is another Ocracoke photo from the Charlie Jones/Mary Ruth Dickson collection. Take a close look, and answer the four question below if you can. l. What is the event? 3. Who is astride the pony? 4. What are the three prominent houses in the background? Almost 2,000 sailing vessels have wrecked off the coast of the Outer Banks. Still today, ship timbers are occasionally uncovered on the beach, especially after a storm or hurricane. This photo (from the Charlie Jones/Mary Ruth Dickson Collection) was taken sometime in the mid-1950s. 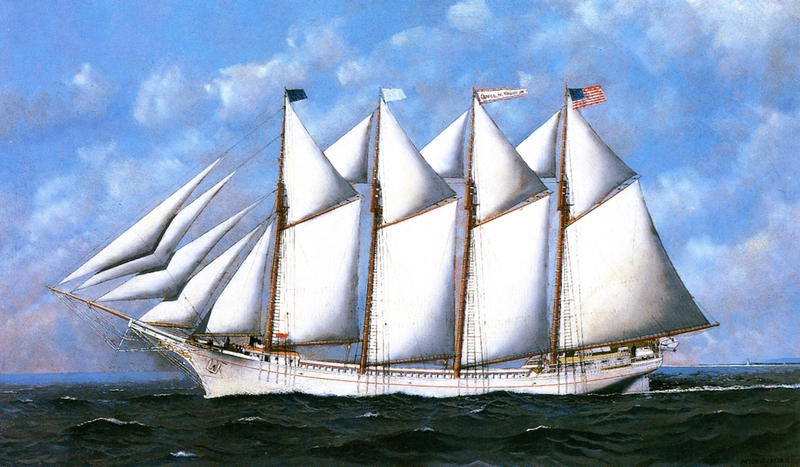 Can any of our readers identify this ship, and tell us in what year it wrecked? If you can, please explain how you know. 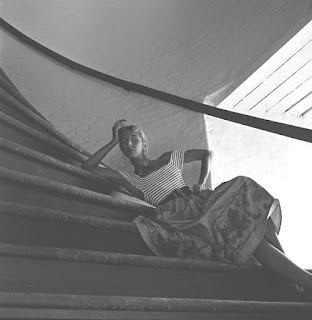 Last summer Lou Ann discovered that Brook Ashley had the only photograph I am aware of that shows the original wooden stairs in the Ocracoke Lighthouse. Pictured on the stairs is Dare Wright (1914-2001), model, photographer, and author of popular mid-twentieth century children's books, including The Lonely Doll, and Holiday for Edith and the Bears (set on Ocracoke Island). According to a 1975 clipping from the Coastland Times, "The wooden stairs inside the Ocracoke Island lighthouse were replaced [in 1950] with a steel spiral stairway at a cost of about $3,000." 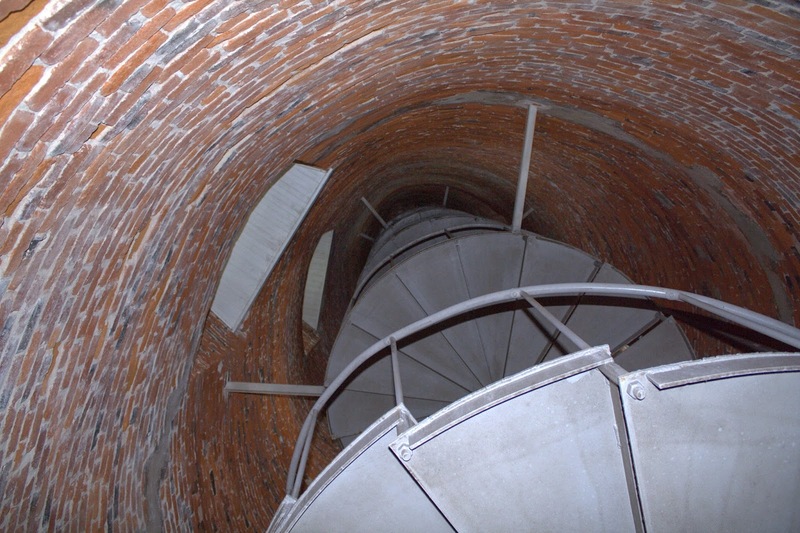 Indications of the original stairs are still visible on the inner wall of the lighthouse. For more information about Dare Wright and her books, including Ocracoke in the Fifties (edited by Brook Ashley and John Ogilvie), visit http://www.darewright.com. There was also high water in areas of the village, but I haven't heard of any major damage or serious flooding. Here is an idea that seemed promising at the time, but never "took off." In 1970 a Raleigh business, Variety Vacations and Sports Enterprises, introduced the new idea of using hovercraft on the Outer Banks. "Able to travel on both land and water," the hovercraft was demonstrated for the curious in Roanoke Sound. Hovercraft use blowers to produce a large volume of air below the hull that is slightly above atmospheric pressure, which lifts the vessel above any flat surface. I couldn't find a picture of a 1970 hovercraft, but located this one of a recent hovercraft in operation in Germany. 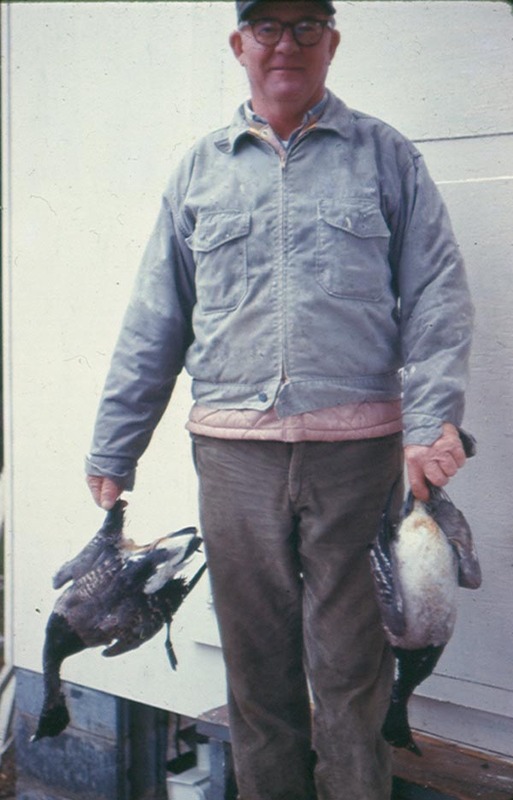 Waterfowl hunting has been a tradition on the Outer Banks for hundreds of years. 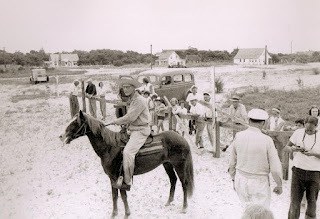 Here is a 1960s photo of an Ocracoke hunter. Can any of our readers identify this man? For information about waterfowl hunting in the 2015-2016 season, click here: http://www.ncwildlife.org/Portals/0/Regs/Documents/Waterfowl-Late-Seasons.pdf. "You could walk on the ice of Pamlico Sound. You didn't try to walk all the way across because it was anybody's guess as to how thick it froze. I've no doubt that you can't solidly freeze a body of water as close to Ocraocke Inlet as we were located, at our hunting camp on little Beacon Island about three miles west of Ocracoke. One could look out and see not just a flat sheet of ice but real mounds where the ice had skidded on top. My father and I and our companion named Bill Williams spent 21` days at the camp. For heating we just had our regular supplies for the plain wood stove. 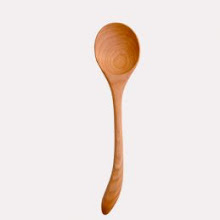 Wood was all we'd got. We had no radios in those days so we just sat it out." For more about the Big Freeze of 1917, read our 2014 post: The Winter of 1917-1918. It is always interesting to find starfish on the beach. Sometimes hundreds of them wash up at the same time (is it part of their natural life cycle, the result of unusual currents, or because of some other factor?). Normally we find colorful purple and orange starfish (Astropecten articulatus), or larger gray starfish (Luidia clathrata). Every once in a while these plumper specimens, sometimes just called common sea stars, wash up. 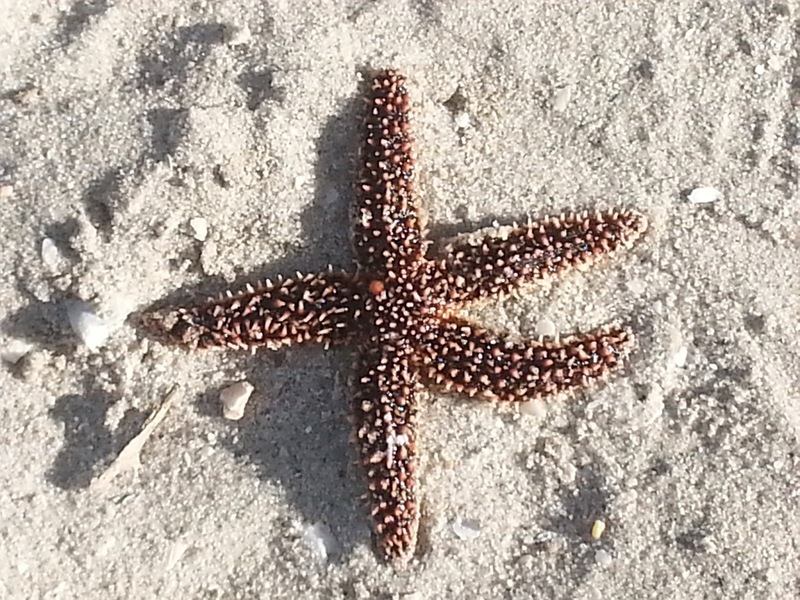 Can any of our readers provide the full scientific name for this echinoderm? In the late 1800s a fierce storm brought tide into the village from the ocean side. A schoolhouse located "Down Point" was badly damaged. Accounts indicate that the sea tide swirled around the building and undermined the foundation piers. As the tide rose higher the schoolhouse was lifted up and washed across the road onto a lot owned by James and Laurette Bragg (today Leroy O'Neal has a home on this lot, not far from Albert Styron's Store). In 1894 James and Laurette Bragg sold their property to the Schoolhouse Committee since the schoolhouse was already on the land. The schoolhouse was "moved by the hand of God" according to 19th century islanders. I was recently given a box of old copies of the Ocracoke Island News. In the March 31, 1983, issue I read about a Variety Show Fund Raiser. David Senseney was the Master of Ceremonies. There were various skits and songs performed by local entertainers and musicians. The highlight of the evening was the "Miss Ocracoke 1983" contest. The contestants were Reggie Ballance (Miss National Park Service), Jim Strickland (Miss Coast Guard), Mark Wilkinson (Miss Hog Shoal), Henry Ballinger (Miss Pit Toilet), Chester Lynn (Miss Patties Holler), and Wylie Whitehurst (Miss Cat Ridge). Danny Garrish was the Master of Ceremonies for the "beauty pageant." Kevin Cutler, Jenetta Henning, and Marion Austin were the judges. Second runner up was Miss National Park Service. First runner up was Miss Coast Guard. The new Miss Ocracoke 1983 was Miss Cat Ridge. The Variety Show raised $534.04 for the Ocracoke Fire and Rescue Squad. If anyone has photos of this event please send copies to me. I would love to print them! And...maybe we should have a Miss Ocracoke 2016 contest sometime this winter. Another fund raiser for the Fire Department maybe? ?